This morning, the BC Ministry of Attorney General announced the new Online Divorce Assistant Application. 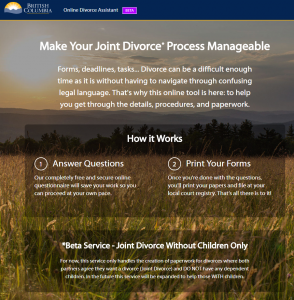 This new online tool will assist people in BC to finalize divorces. It is intended to speed up processing times and to help get rid of filing errors. Who is it for (currently)? who intend to “joint-file” their divorces (work together, in cooperation, to get the job done). Currently, 30% of the 10,000 divorces filed every year in BC are filed jointly. You can use the Online Divorce Assistant on any smartphone or computer, but it is ideally viewed on devices that are at least tablet-sized. It takes about 15-30 minutes to complete. Once you go through the app and answer all its questions, you can print out the finished documents and take them to a BC Supreme Court registry for filing. Will the App change over time?